Imaginary Sunshine » Caricature of me! J (the less annoying and more sane half of my chemistry lab group!) drew this caricature of me during our chem lecture today. She had originally attempted to draw me with a poking finger, because I poked her to get her attention because she would not stop clicking her damn pen. But I said that it looked like I was hold a chainsaw, so I pulled out my red pen (oh, Staedlter fine liners, what would I do without you?) and coloured in a bit of the chainsaw/finger and then drew blood drippings and a pool. 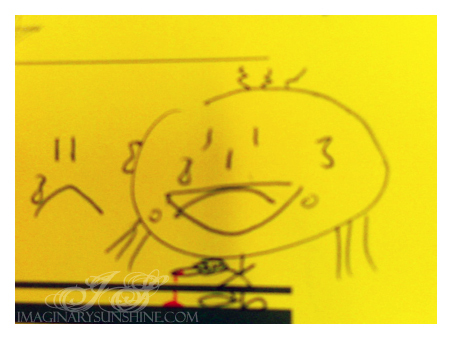 J then turned that frown she drew on ‘my’ face upside down into a smile. I’m missing glasses though. It’s a little blurry though, it looks more clear on my cell phone. Oh, damn you non-Carl Zeiss camera lens. And lack of zoom. Wow, I never knew you had such a gigantic head. University has obviously swollen your brain since we last saw each other. Please do tell how you manage to avoid snapping the itty bitty neck and body that holds it up.